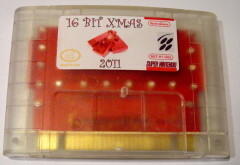 It's that special time of year we spend with family and friends, a time of rejoice and generosity, a time for sipping eggnog whilst warming our socks in front of a toasty fire, and time for the first ever 16 BIT XMAS, a Christmas Craze of presents! 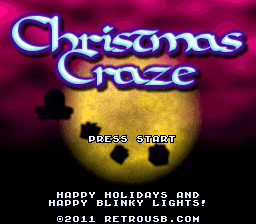 Gather up all of your best friends for the first SNES homebrew game by RetroZone, Christmas Craze, written by Shiru. 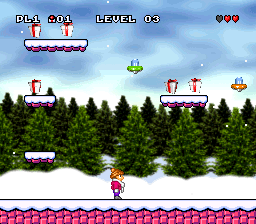 Dodge aliens and grab gifts or fight your friends with snowballs in two player present picking battles. While everyone is drunk on egg nog trip out to the colorful blinky lights that surround the edge of the cart! When you gather presents in the game the lights dance with the sound effects. If you just want to play the game, here is a free ROM download! Load it up on your SNES PowerPak or favorite emulator and destroy your friends. You will be sad you are missing out on the amazing blinky lights. This is only required if you ordered your cart with Custom Text. If you did not, your cart will come with a generic Happy Holidays message. The on screen message is 2 rows, 24 characters each row including spaces. Only capital letters, numbers, and simple punctuation will be used. See the demo ROM for an example of the custom text. The printed card will use the same message as the cart. Works on authentic Nintendo Super Nintendo and Super Famicom systems. Works on clones like the Retro Duo and FC Twin.